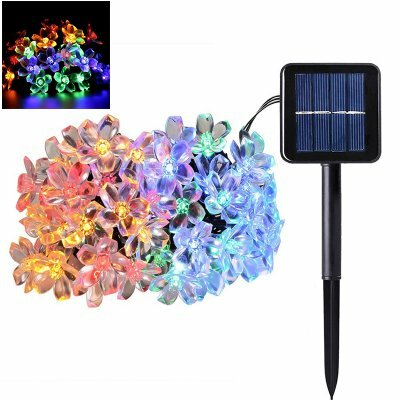 Successfully Added Colorful LED Light String - Snow Flower Design, 4 Colors, 7 Meters, 50 LED Lights, Solar Powered, 400mAh Battery, 2 Light Modes to your Shopping Cart. Light up your house and garden and enjoy the true holiday spirit with this colorful LED light string. Brining hour’s worth of light and joy into your life, these LED lights are sure to get you into the holiday mood during the upcoming winter months. Featuring a beautiful snow flower design, this LED light string is perfect to be used for decorating your home or garden. With a service life of 40.00 hours, you can be assured that these color lights will provide you with light in the darkness for many years to come. Featuring two different lighting modes and four different light colors, this LED decoration is sure to set the right mood and atmosphere at any occasion. Coming with its own solar panel, you can be assured that this beautiful LED light string never fails to light up its surroundings. Even during the upcoming winter months you can be assured that there will be light in the darkness as this colorful light string holds a sophisticated 400mAh battery that, when fully charged, provides enough energy to get through the longest of winter nights. From now on you’ll always be able to enjoy its beautiful colors and decorate your garden or home in the way you’ve always dreamt off. With these colorful LED decoration lights you’re sure to bring the Christmas spirit into your household. Featuring a total of 50 colorful LED lights, this 7m light string allows you to decorate a significant area. Besides being used as Christmas decoration for your house or garden, these beautiful LEDs can additionally be used to decorate a bar, restaurant, terrace or children’s bedroom. With its timeless and beautiful design, these flower shaped LEDs are sure to set the right atmosphere for countless of occasions. Coming with different color LEDs, this decorative LED light string holds 13 red, 12 yellow, 12 blue, and 13 green LED lights – brining some true color and joy into your life. Sure to fit the liking of everybody out there, this LED light additionally features two light modes – allowing you to switch in between normal and flash lighting. Whether you use them to decorate your house or garden for the upcoming Christmas holidays or simply like to decorate your backyard terrace or children’s bedroom with these colorful lights – with this LED light string you can’t go wrong.